At least 41 people were killed and over 34 others, including the provincial police chief, were injured as a suicide bomber blew his explosive up near a mosque in Maimana, the provincial capital of Faryab in northern Afghanistan, on Friday, an official said. "A suicide bomber targeted a mosque while people were leaving the mosque building after the Eid-ul-Adah prayers at around 9 am local time (0430 GMT) Friday in Maimana city, killing 41 people and injuring 34 others," deputy to provincial governor Abdul Satar Bariz told Xinhua. 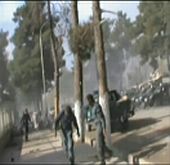 The dead included 23 members of the Afghan National Police, Bariz said, adding that the provincial police chief Abdul Khaliq Aqsay was among the wounded. The bomber masked himself in a police uniform as security was tighten by the ALP and the high-ranking provincial officials were attending the prayers in Eid Gah mosque, the biggest mosque in the city, Bariz said. Citing a member of Afghan parliament from Faryab province, Bariz said that the number of the casualties could rise as many of the wounded were said to be in critical conditions. The blast caused a plume of grey smoke to rise above the scene. The wounded, along with the bodies of the dead, have been taken to provincial capital hospitals by police and civilian cars, the official said, adding that those in critical conditions will be transferred to neighbouring Balkh province. The Muslims' biggest three-day festival of Eid-ul-Adha falls on Friday, October 26, which is also known as the festival of sacrifice and is being celebrated worldwide on the 10th day of Duhl-Hijja, the last month of the Islamic year.